Marriage brings a number of changes and compromises to this blogger's formerly autonomous life. Going to bed early. Eating square meals. Minding a budget. Perhaps the biggest change will not come for another 14 months, but come it surely will: a move to Chicago, IL. My wife accepted a tenure-track offer from a university in the Chicagoland area starting in September, and my husbandly duties compel me to follow as soon as the completion of exams and coursework allow. Leave it to my lovely wife to fulfill my fantasies of living and working in a major metropolitan area in the Great Lakes region. I can't wait to get my hands on some wall maps like this. 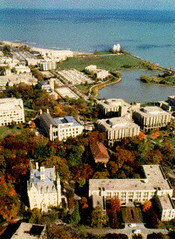 Lakefill and North Campus spotted. Wait is that the shot of Cabrini-Green from the opening credits of Good Times?